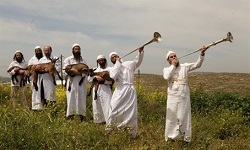 End Times News this month starts with a Passover animal sacrifice happening this Friday (April 22, 2016) amid Jewish hopes that one day soon the al-Aqsa Mosque will be gone so that the temple could be rebuilt and sacrifices offered there. There is also another temple in the news. 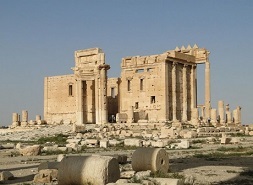 ISIS destroyed various historical sites as they took over parts of the Middle East. Replicas of the arch of the Temple of Baal originally built in Palmyra, Syria are being erected in London and New York and planned for other cities around the world. Is this just an attempt at preserving archaeology or is there something more significant going on? 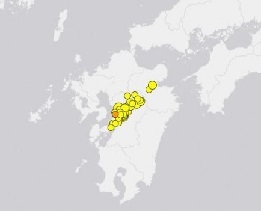 Lots of serious earthquake activity with a major Japanese island almost looking like it could split in two. Also some stories that impact religious liberty. At the same time, Donald Trump says if elected he will give U.S. churches more power. What could that mean? 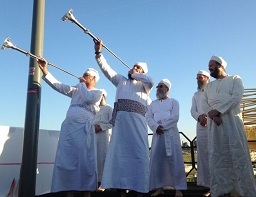 Cohanim priests taking part in the Passover ritual. The model ceremony included the various ancient Temple rites prescribed by the Torah and Jewish law, including the slaughtering of a lamb by Cohanim, priests, in the white robes used in Temple times. At a model Passover sacrifice ceremony on the Mount of Olives attended by approximately 400 people, several public figures expressed the hope that the Dome of the Rock shrine and the al-Aqsa mosque will soon be removed from the Temple Mount. Hard-right Jerusalem city council member Arieh King said he hoped that the Temple Mount would soon be free of what he termed "the abomination" currently at the site, while Rabbi Yisrael Ariel, head of the Temple Institute and a former Knesset candidate for the banned Kach party said the event was preparation for when the Temple Mount would be "flattened and cleaned" and the Temple rebuilt. The model ceremony included the various ancient Temple rites prescribed by the Torah and Jewish law, including the slaughtering of a lamb by Cohanim, priests, in the white robes used in Temple times, the sprinkling of the blood and the burning of fats and other parts of the lamb on a model altar, and the blowing of trumpets by the Cohanim. It was conducted just next to the Beit Orot yeshiva on the Mount of Olives in full view of the Temple Mount. The Passover Sacrifice is one of the religious commandments of the Torah obliging Jews to sacrifice a lamb on the Temple Mount on the day before the Passover pilgrimage holiday and eat on the first night of the festival. The organizers, the Joint Staff of Temple Organizations, emphasized that the event on Monday was a simulation and not supposed to represent the actual sacrifice. Speaking before the ceremony began, King, who heads the United Jerusalem faction in the Jerusalem Municipal Council decried the current situation in which said that Jews were still prevented by the government from going to the Temple Mount and performing the Passover sacrifice. "We're here opposite the Temple Mount," he continued. "We can see the abomination upon it and we need to wish that even in our days we won't see it anymore and we'll see there the altar, the Cohanim and Levi'im and we'll see ourselves there." MKs, leading rabbis and other public figures to attend event, as public interest in reviving ancient practice grows. The public reenactment of the Passover Sacrifice, which has become a popular spring-time event over the past few years, will be getting closer to the actual site of the Temple Mount next week. This year's reenactment may prove to be an even more festive event than ever, as many new participants are planning to arrive from all parts of the country. The past Paschal Reenactments were held in a school courtyard which became more cramped each year due to the growing popularity of the important event. For this reason the organizers decided to move the event this year to the more spacious location of Mitzpeh Beit Orot, between Mount Scopus and the Mount of Olives, near Emek Tzurim, which faces Judaism's holiest and most relevant site for the occasion, the Temple Mount. The reenactment will take place next Monday, just four days before the prescribed time of the Paschal Offering. Event organizers say they want to offer a taste of an exciting, authentic Jewish experience, "with its smells, sounds, and colors that have been lost to us these 2000 years, and to thus arouse a longing to renew this Temple ritual in our day." Numerous rabbis and public figures will be attending. Among them is the Chief Rabbi of Jerusalem, Rabbi Aryeh Shtern, who at last year's reenactment expressed his great amazement at the public's desire to reinstate the Paschal Sacrifice, which in his words was, "much greater than he expected." Also attending will be several Members of Knesset and the Deputy Mayor of Jerusalem, Dov Kalmanovitch. I am about to share with you some absolutely astounding information. It turns out that the exact day when reproductions of the arch that stood in front of the Temple of Baal are going to be erected in Times Square in New York City and in Trafalgar Square in London is also the exact day when a very important occult festival related to the worship of Baal begins. April 19th is the first day of a 13 day period of time known as "the Blood Sacrifice to the Beast" that culminates on the high occult holy day of Beltane on May 1st. In some parts of the world, Beltane is much better known as "May Day", and it has been described as the "Illuminati's second most sacred holiday". 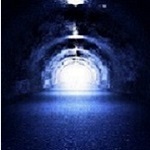 As you will see below, we have indeed witnessed a disturbing series of "blood sacrifices" during the second half of April in recent years, and many people wonder if there is a connection. April 19th is also known as "the Feast of Moloch". If you are not familiar with "Moloch" or "Molech", it is an ancient Canaanite god that is repeatedly denounced in the Old Testament. Child sacrifice was a key feature of the worship of Moloch, and a giant statue of this pagan deity is set up at the Bohemian Grove in northern California every year. JERUSALEM - Prime Minister Benjamin Netanyahu of Israel led a cabinet meeting in the Israeli-controlled portion of the Golan Heights on Sunday, calling on the world to recognize Israeli sovereignty over the conquered territory and vowing that Israel would never give it back to Syria. Mr. Netanyahu made his remarks at what his office described as a "festive" meeting of the cabinet in one of the Jewish settlements on the strategic plateau that Israel captured in the 1967 Middle East war. Israel later effectively annexed the Golan Heights in a move that was never internationally recognized. 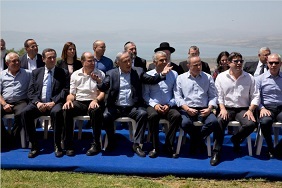 Officially, the occasion for holding the first formal cabinet meeting in the territory was to mark a year since the formation of Mr. Netanyahu's current right-leaning government. Yet the timing, according to experts, was more likely dictated by Israeli concerns arising from the recently resumed talks in Geneva over Syria's future - or hopes that the talks might present an opportunity for Israel. "The Golan Heights have been an integral part of the land of Israel since ancient times; the dozens of ancient synagogues in the area around us attest to that," Mr. Netanyahu said at the start of the meeting. "And the Golan is an integral part of the state of Israel in the new era." Ray's note: Compare the story above to the one following. Looks like a recipe for trouble to me. Syria hit back at Israel Sunday hours after Prime Minister Benjamin Netanyahu vowed that the Golan Heights will remain in Israeli hands. Deputy Foreign Minister Faisal Mekdad warned that his war-torn state would retake the plateau by any means necessary. Netanyahu had convened the first-ever cabinet meeting in the Golan Heights, and used the occasion to declare that the territory seized by Israel in the 1967 Six Day War would forever remain a part of Israel. Mekdad declared that the "Arab Syrian Golan Heights" is still occupied territory according to international law and would eventually be taken back from the Israelis. "All options are on the table for getting back the occupied territory from Israel," Mekdad told the Beirut-based al-Mayadeen news channel. "We are prepared to do anything in order to return the Golan to the Syrian motherland, including using military force." Belgium said Tuesday that more "terrorist fighters" want to return to Europe from Syria to carry out further attacks, a month after suicide bombings in Brussels killed 32 people. "There is a lot of intelligence, for example signs that foreign terrorist fighters, combatants in Syria, want to return not just to Belgium, but to Europe to carry out an attack," Paul Van Tigchelt, the head of the government crisis center, told RTBF television. Tigchelt said Belgium would maintain its terror alert at level 3, the second highest, for a "terrorist threat to the whole country", adding that it meant that the threat was "still considered serious, grave and likely". The inquiry into the March 22 Brussels bombings - which were claimed by the Islamic State jihadist group - was "being carried out in an intense way… but the danger has not yet gone," Tighchelt added. Security was still tight at key sites such as airports, railway stations and nuclear power stations, he said, adding that public areas such as shopping malls and cinemas could also benefit from more security. Two suicide bombers blew themselves up at Brussels airport and a third at Maalbeek metro station in the country's worst ever terror attacks. Christianity is being challenged at all levels to conform and compromise to the will of the majority. North Carolina is experiencing political and corporate pressure for upholding a Godly standard, but so are everyday Christians at school and work. Two important cases were recently rejected on appeal as Christians fought for the right to share their faith and hold to Biblical convictions in the United Kingdom. Felix Ngole, a Christian studying to be a social worker at the University of Sheffield, has lost his appeal against expulsion after he was dismissed from the school earlier this year for posting on his Facebook page messages in favor of Biblical marriage. Felix was advised that his Facebook post "may have caused offence to some individuals" and had "transgressed boundaries which are not deemed appropriate for someone entering the social work profession." Following additional meetings, the Sheffield committee concluded that Ngole's beliefs would negatively affect his "ability to carry out a role as a social worker,". In his defense, Ngole commented that "Like every other student at university, I use social media to communicate and express personal views. In my Facebook posts in question, I simply expressed support for the Biblical view of marriage and sexuality." Ngole appealed the ruling however the appeals office has defended the ruling and Ngole remains suspended from the school. In a similar fashion, Victoria Wasteney, an occupational therapist working at the St. John Howard Center in London was suspended after her co-worker accused her of trying to convert her to Christianity. During the Soviet era, thousands of churches were destroyed and millions of Christians were persecuted. Communist textbooks called religion "the opium of the people" and Christianity "a perverse reflection on the world." In the 24 years since the fall of the Soviet Union, however, Orthodox Christianity has made an astonishing recovery. While only a third of Russians identified as Orthodox in 1991, over two thirds now identify as Russian Orthodox Christians. Yet the rise of the Orthodox Church hasn't brought religious liberty to Russia. It has simply replaced the Communist Party as the ideological state apparatus used to forcibly unite Russians! In a court case under way in southern Russia, Viktor Krasnov is facing up to a year in prison for writing "There is no God" on VKontakte (a Russian social media network similar to Facebook). The authorities became aware of this comment when an online user contacted them, claiming that Krasnov was offending Orthodox believers. Police raided Krasnov's apartment and forced him to undergo a monthlong examination at a psychiatric ward. Once he was deemed fit for trial, he was charged under a Russian law that makes it illegal to insult the feelings of religious believers. It isn't just atheists who are no longer granted religious freedom in Russia. Alexey Koptev was arrested in 2011 after undercover police officers established that he belonged to the Jehovah's Witnesses Christian denomination. In 2009, the city of Taganrog banned the Jehovah's Witnesses denomination for propagating the exclusivity and supremacy of its religion. This denomination now shares the same legal status as the Islamic State and the National Socialist Society. In 2002, Russia enacted an extremism law with a provision defining religious extremism as "incitement of religious discord" in connection with acts or threats of violence. Five years later, the law was amended to allow prosecution for inciting religious discord even in the absence of any threat or act of violence. Mormons, Scientologists and even Pentecostals are now coming under increasing government pressure. In return for public support from Russian Orthodox clergy, President Vladimir Putin attends church services and portrays himself as a defender of "Christian values." Like the Byzantine emperors and Russian czars before him, he is using a de facto state religion to unify his empire! 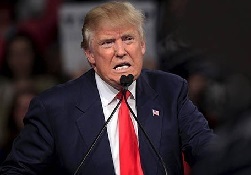 Donald Trump wants the churches to have more power and pastors to speak more boldly. He has pledged to do it if he is elected president. "They've taken a lot of the power away from the church. I want to give power back to the church. Christianity is really being chopped; little by little it's being taken away ... I want pastors and ministers to be able and get up and speak on behalf of Christianity," Trump said, "and they're afraid to do it right now because they don't want to lose their tax exempt status. We will take care of that." Trump believes that the federal government should have never taken away the power of the church. He is referring to the Johnson Amendment in which the U.S. tax code was altered so that tax-exempt organizations (like churches) would not be allowed to endorse or oppose political candidates. "In public, he can be rough around the edges for sure but his narrative is of a guy who gets things done," said David Brody of the CBN Brody File. "His brand is accomplishment and so when he says he's going to 'take care of the evangelicals' and start winning again for Christianity, many people believe him at face value. It's a great 'trump' card to have in your political hip pocket. "I'm a Christian. I'm Protestant. I'm Presbyterian. I think that Christianity frankly, I think Christians in our country are not treated properly. The bill that was passed during the Lyndon Johnson era is horrible because I see churches where they're afraid to be outspoken because they don't want to lose their tax-exempt status and I realize that is one of the problems. I know people who want to endorse me but they're afraid to endorse anybody because they don't want to get political so essentially they've taken a lot of the power away from the church. I want to give power back to the church because the church has to have more power. Christianity is really being chopped; little by little it's being taken away." If Donald Trump is elected president of the United States, be prepared to see the final Sunday law movement begin in earnest. Political support will embolden the churches, and very rapidly the end-time image of the beast predicted in the Bible could unfold before our eyes exactly as predicted. This is no laughing matter. Those who scoff and ridicule these predictions will face their reality unprepared. "You're not free if your beliefs are confined to your mind"
"Mississippi's faith-based communities were given a legal victory on Tuesday when the state's new religious freedom bill passed. Gov. Phil Bryant's signature on HB 1523 provides legal cover to individuals who refuse to provide services when their religious principles are jeopardized. "'I have signed HB 1523 into law to protect sincerely held religious beliefs and moral convictions of individuals, organizations and private associations from discriminatory action by state government or its political subdivisions, which would include counties, cities and institutions of higher learning,' Bryant said in a statement released Tuesday. 'This bill merely reinforces the rights which currently exist to the exercise of religious freedom as stated in the First Amendment to the U.S. Constitution.'" "Could bring our civilization to a cold, dark halt. NORAD is relocating its headquarters to a secret bunker inside the Rocky Mountains. The cost? Nearly $1 billion. Asked why, the Base Commander offered a clear, yet chilling reason. The term used by security experts is "Black Sky Days." ISIS attacks in California and Paris may be just the beginning of an unprecedented plot to bring America to its knees by targeting our nation's scandalously vulnerable electric grid, warn officials at the Pentagon and FBI. Why? Because terrorist groups like ISIS realize they can't beat us with brute military force on the conventional battlefield. We're way too strong for that. It's like when the heart stops pumping... everything shuts down and the patient flat lines. ISIS terrorists are already inside our country. Former CIA official Dr. Peter Pry warns, "There is an imminent threat from ISIS to the national electric grid and not just to a single U.S. city." Dr. Pry says that attacks on just 9 of the nation's 55,000 electrical substations could result in nationwide blackouts for up to 18 months. The government is woefully unprepared. It seems like the government has been fixated on taking more & more away from people who worked hard to earn it, while doing virtually nothing to secure our nation's infrastructure. They've ignored dire warnings from experts about the grid's vulnerability to physical, electromagnetic pulse (EMP) and cyber-attack by ISIS and other terrorist groups. "Our death toll would be staggering" reports FOXNews. We've all been fine when the power goes out for a few hours and even days, but an extended blackout would be devastating. Frank Gaffney, founder of the Center for Security Policy predicts that "... should the power go out and stay out for over a year, 9 out of 10 Americans would likely perish." Veteran news anchor Ted Koppel just wrote a book called Lights Out that details this exact scenario. And CENTCOM General Lloyd Austin says, "It's not a question of if, it's a question of when." "Harvard economist Larry Summers says 'it's time to go after big money,' and he wants to start by banning the $100 bill. But critics say he and other globalist elites may have an ulterior motive for such a move. "The former U.S. Treasury secretary and chief economist of the World Bank recently penned an op-ed in the Washington Post calling for removing the 500 euro and $100 bills from circulation. "Summers is a member of the elitist Trilateral Commission, co-founded in 1971 by David Rockefeller and Zbigniew Brzezinski, and has operated at the highest echelons of global finance. "The argument being parlayed by global elites is that high-denomination bills are often used by crime syndicates and terrorist cells. "But Wood, an Arizona-based economist, says eliminating the $100 bill has little to do with fighting terrorism or crime and everything to do with continuing to chip away at the availability of cash." Over the past 48 hours, our planet has been hit by literally dozens of earthquakes of magnitude 4.0 or greater, and scientists are acknowledging that what is taking place is highly unusual. This strange shaking began toward the end of last week when the globe was struck by five major earthquakes over the space of just two days, and over the weekend the seismic activity just continued to escalate. Very early on Saturday, Japan's southern island of Kyushu was hit by a magnitude 7.3 earthquake, and on Saturday night a magnitude 7.8 earthquake struck off Ecuador's Pacific coast. It was the worst earthquake that Ecuador had experienced since 1979, and it was followed by at least 163 aftershocks. Unfortunately, there are indications that what we have seen so far may be just the beginning. A second major earthquake in less than two days has shaken Japan's southern island of Kyushu, with at least 34 people thought to have been killed, about 1,500 injured and more feared buried after building collapses and landslides. A series of powerful earthquakes which struck Asia and South America in the past week could be followed by a 'mega' quake in the near future, a scientist has claimed. 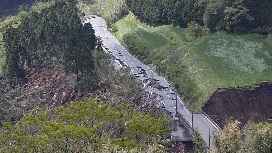 On Thursday and yesterday, two earthquakes struck Japan, killing at least 41 people, causing landslides and widespread damage to buildings and infrastructure. Today, a 6.1 magnitude quake struck southeast of the Pacific island nation of Tonga, with no immediate reports of damage. And at the other end of the infamous Ring of Fire, Ecuador was also struggling after a major 7.8 quake which hit last night, killing at least 77. Roger Bilham, a seismologist at the University of Colorado, told The Daily Express: 'The current conditions might trigger at least four earthquakes greater than 8.0 in magnitude. In addition to the four major earthquakes to have struck since Thursday, last week there were also shakes in the Philippines, Vanuatu and Myanmar. All of the earthquakes have occurred in countries straddling the so-called Ring of Fire. This is a horseshoe-shaped series of trenches spanning the Pacific Ocean where tectonic plates are shifting and seismic and volcanic activity is common. The U.S. Geological Survey, an independent agency which monitors natural hazards such as earthquakes, says 'mega' earthquakes are rare, but not impossible. It says there is no fault line - the areas where shifting plates that make up the earth's crusts meet - is known which is capable of generating a magnitude 10 earthquake. Tuesday on TruNews, Pastor Rodney Howard-Browne, founder of Revival Ministries International, told host Rick Wiles he believes Donald Trump is the New World Order's "worst nightmare." "Coming from outside America—and having become citizens of the USA-we see things a little differently. We see it from a global perspective; from what is happening globally. We know that the Bible tells us that the devil's end-time plan is a one-world religion, one-world money system and one-world government-a 'New World Order.' This is a plan that threatens every freedom we have and hold dear. "Christianity and the Bible is a threat to this global plan. So is anyone who thinks for themselves. The American Constitution-the document that made America the great nation it is-stands in the way of this global agenda. This is why it has been under attack-from our own president, and others, on down. We realize that it is the New World Order's Agenda to destroy the United States."